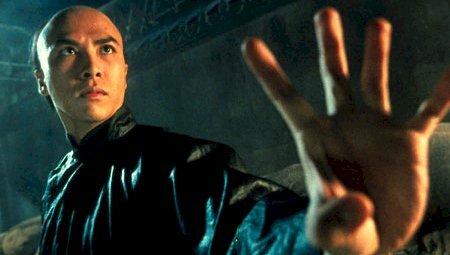 The Skinny: Arguably the greatest kung fu film Yuen Woo-Ping ever made, Iron Monkey ranks as one of the finest martial arts films of the 1990s. There are only a select few Hong Kong films in existence that perfectly optimize the very genre in which they fall under. It's safe to say that celebrated action director Yuen Woo-Ping has had a hand in more than a few motion pictures that would fit that description, and his 1993 kung fu opus Iron Monkey is no exception. If ever a Hong Kong cinema neophyte wanted to know what a period martial arts film is supposed to be likein terms of action, plot, performances, and the requisite comic reliefIron Monkey would definitely serve as a prime example. The film follows the exploits of Dr. Yang (Yu Rong-Guang), a kindly physician who spends his days tending to the sick, but leaves his evenings open to right wrongs in the guise of the shadowy Iron Monkey, a sort of Chinese Robin Hood (or Zorro, if you prefer) who relentlessly fights against the oppressive machinations of the ruling Ching government. The beautiful Orchid (Jean Wang) assists our hero in both his identities, providing the movie with the required love interest/eye candy. But as with most films of this ilk, the romance is implied rather than explicit, leaving ample time to showcase the one thing audience members expect from a kung fu filmnamely, kung fu! The potential for kung fu fisticuffs increases exponentially when two newcomers stroll into town: Wong Kei-Ying (Donnie Yen), member of the fabled "Ten Tigers of Canton"; and his son Wong Fei-Hong (Tzang Tse-Man), a boy destined to be a legend in his own right. Unfortunately for the Wong family, the local authorities are arresting people left and right in the hopes of catching the Iron Monkey, and thanks to a marvelous display of martial arts prowess on the part of Wong Kei-Ying, both of the Wongs are hauled off to court. Even though Kei-Ying is cleared of the charges, his troubles don't end there. Impressed with the elder Wong's martial arts abilities, the local magistrate holds Fei-Hong hostage, ordering Kei-Ying to bring in the Iron Monkey. If he fails, it's curtains for the boy. To make matters worse, the Ching government sends in Hiu Hing (Yen Shi-Kwan), a high-ranking official who is not only ten times more corrupt than the local governor, but also a disgraced Shaolin monk adept at the deadly art of Buddha's Palm. With Fei-Hong and later Orchid in the hands of the enemy, Kei-Ying realizes that his only hope is to join forces with Iron Monkey and face the bloodthirsty Shaolin traitor as a team. Good call. It's no exaggeration to say that Iron Monkey is one of the best martial arts films of the last decade. In terms of action, few films could top it. Even though there's some obvious wirework, it feels more like an enhancement rather than a "cheat" thanks to the unquestionable martial arts skill of actors like Donnie Yen. And unlike some other filmseven ones that boast topnotch action choreographyIron Monkey never feels repetitive. Each fight builds upon the last one, climaxing in what could be described as a martial arts crescendo. In one of the more memorable fight scenes in Hong Kong history, Wong Kei-King and Iron Monkey fight valiantly against the villain, each of them trying to maintain their balance on some precariously high wooden posts. That may sounds easy enough for masters of kung fu to handle, but when you factor in that EVERYTHING IS ON FIRE in the scene, well, not so easy, is it? Although the kung fu is most impressive, it's the other "less important" elements of the film that help make Iron Monkey a genre standout. The plot is refreshingly straightforward with few zany digressions and none of the unnecessary convolutions that seem to plague even the most simplistic films of this genre. Comic relief is almost a requirement in this kind of picture, and some silly moments arise, but not to excess or annoyance. The seeming restraint may put off some, but there's a certain undeniable symmetry to the proceedings that would probably merit Iron Monkey a nomination for "Perfect Kung Fu Movie," if such an award existed. I saw Iron Monkey for the first time during it's 2001 U.S. release. I knew relatively little about it except that it is considered a classic kung-fu film. When I realized it was about young Wong Fei-Hung, it was like opening a surprise gift. Since I'm a big fan of the Once Upon a Time in China movies, and am familiar with the long, rich cinematic history of the character in HK movies, Iron Monkey became even more enjoyable to me than it might have been otherwise. I patiently waited for the Wong Fei-Hung theme music to kick it. However, when it never did, I realized that it was probably because the film had been rescored for its American release. The music was actually pretty good compared to Miramax's hack jobs on past Asian films. It's possible that Quentin Tarantino's presence (he figures prominently in the credits) had something to do with the overall respect the title was given. The simple fact that it was given a wide release in Cantonese language with English subtitles is a great thing in and of itself. Iron Monkey tells the story of local doctor (Yu Rong-Guang) who dons a mask during his off time as the Iron Monkey. He steals riches from corrupt village officials and gives the money to the poor, ala Robin Hood. When a pre-teen Wong Fei-Hung (played in the grand Cantonese tradition by a girl) and his legendary father Wong Kei-Ying (Donnie Yen) come to town, they get involved in the Iron Monkey's struggle, the result being one of the greatest kung-fu films I have ever seen. Each fight is better than the last and the final fight (which takes place mostly on top of burning wooden poles) is truly a thing of genius. Helping matters is the fact that the main bad guy in the film is played by Yang Yee-Kwan (Iron Robe Yim from Once Upon a Time in China).  The Dimension Home Video DVD includes a brief, but informative interview with Donnie Yen as well as a gaffe-filled discussion about Hong Kong cinema with Quentin Tarantino.